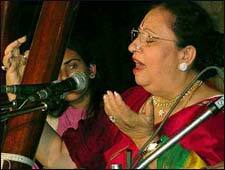 Hindustani Classical Vocal By Begum Parveen Sultana is an event that took place on 29-Apr-2007 in Hyderabad. She is the youngest winner of the Padmasri, awarded to her way back in 1972. That was the last time she underperformed. Don't let us kid you - find out for yourself. The Annual Golconda Cultural kickstarts on 28th April, at Taramati Baradari. This year's edition of the fest will feature three programs on day one and two on day two. Noted musicians like city lad Karunya, flautist Pandit Ronu Mazumdar, violinists Kumaresh and Ganesh, saxophonist Kadiri Gopalnath, percussionist Taufiq Qureshi, the Wadali Brothers and Begum Parveen Sultana will perform during the two-day event, which also features a light-hearted Hindi play, Taj Mahal Ka Tender. Today, the second and final day, Begum Parveen Sultana will perform a Hindustani Classical vocal recital. Sultana ranks today as one of the foremost classical vocalists in India. A child prodigy, she was the youngest artist to receive the Padmasri award, in 1972, from the Government of India. She received her early training from her father Ikramul Majid and her grandfather Mohammed Najeef Khan. Both were ardent music lovers, and their nurturing of her talent at an early age enabled her to give her first recital at a tender age of 12. From then on, there has been no looking back. Her father put her under the guidance of renowned maestro Acharya Chinmoy Lahiri of Calcutta. Sultana subsequently found a guru who laid a much deeper foundation that gave a new dimension to her singing, giving it the required mastery of ragas and voice culture that would expand her range to three and a half octaves - Ustad Dilshad Khan, her guru and husband. Parveen Sultana was trained in the Patiala Gharana (school of music), but with Ustadji’s guidance, the essence of other gharanas flowed into her music. She handles with utter ease a simple as well as a complicated raga, moving from the slow alaap to the swift Taans and Bol Taans, her immense confidence highlighting the most beautiful essence of the raga. Whether she sings a Khyal, Thumri or Bhajan, she keeps the form in its pristine purity. Called the Melody Queen, Sultana has won many awards, like Cleopatra Of Music in 1970, Poetess Of Music in 1972, Gandharva Kalanidhi in 1980, Mia Tansen in 1986 and Sangeet Samragni in 1994. She has also performed in major festivals and venues in India, USA, Europe and Australia. Be the first to comment on Hindustani Classical Vocal By Begum Parveen Sultana! Just use the simple form below. fullhyd.com has 700,000+ monthly visits. Tell Hyderabad what you feel about Hindustani Classical Vocal By Begum Parveen Sultana!